The weather across the country is finally warming up! For many dog owners that means one thing is on their mind, shedding. 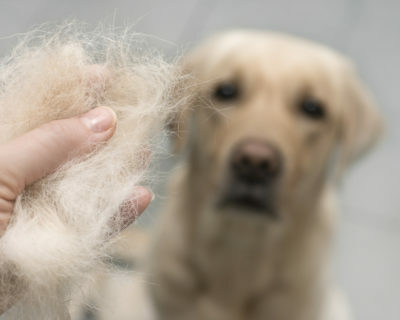 As anyone with a dog can tell you, shedding is an unavoidable occurrence, regardless of age, size, or breed. That cuddly fur that makes your pooch so adorable will inevitably make its way onto your couch, clothes, carpet or anywhere really. As we go from the cold weather to warm spring and summer months, many dogs will be getting rid of their heavy winter coat in favor of a thinner one. Blowing coat like this is what makes double coated dogs, like Huskies or German Shepherds, so notorious for shedding during this time of year. If you have a double coated dog, then you should attempt to help them clear off all that extra hair. If your dog is weighed down with thick fur during a heatwave, they won’t be comfortable and that is no good for anyone! Dogs that have just a single coat should still be brushed and bathed regularly this time of year to help their shedding, even if it amounts to less hair than a double coated dog.